Metamora, Last of Wampanoags. First Americans. Home » Metamora, Last of Wampanoags. First Americans. First Nation. Metamora, Last of Wampanoags. The Wampanoag (accent on the o, English pronunciation:. Wɑːmpənoʊ.æɡ), Pawkunnakut or Wôpanâak are Indians of eastern New England, the Gulf of Maine and the Atlantic coast, whose tribal lands once large parts of the US states of Rhode Iceland and Massachusetts, as well as the islands Martha’s Vineyard, Nantucket and Elizabeth Islands encompassed. The Wampanoag were a confederation of several tribes of the political Pawkunnakut or Pokanoket (“place cleared land”) were dominated, and were therefore designated by European settlers mostly as Pokanoket Confederacy and of them dominated area as Pokanoket Country. The Wampanoag were designated in 1616 by John Smith Pocahontas, after the village of her Obersachems Massasoit near the present city of Bristol, Rhode Iceland. This name was used frequently in early records and reports. The word first appears on Wapanoos Adriaen Block map of 1614 and is probably a Munsee-term for all living east of them tribes. Other synonyms are Wapenock, Massasoit and Philips Indians. 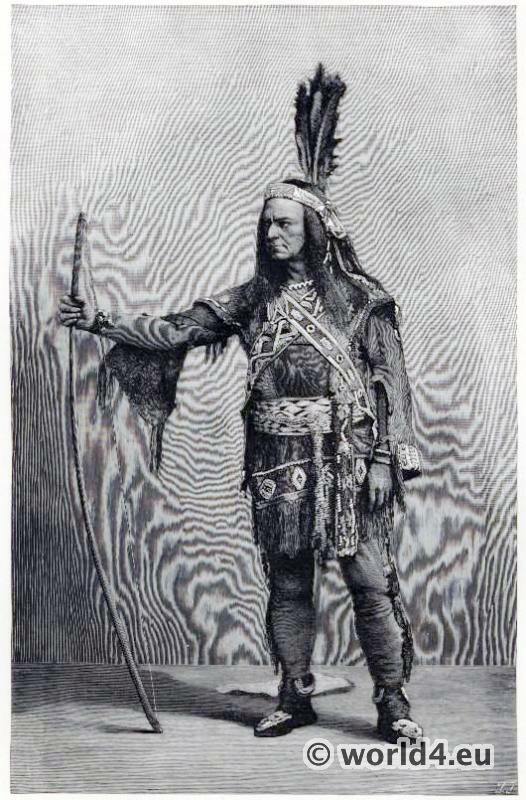 This entry was posted in 19th Century, Native American, North America and tagged Native american dress, North American costumes on 12/28/14 by world4.